The word “shock” gets trotted out a lot when discussing The Handmaid’s Tale. It can be a shock to the system: you don’t have to look hard to see Gilead in our world, right now ; the show also goes out of its way to make it plain that the advent of Gilead was swift and far too easy. It’s also shocking in the way that dark, upsetting entertainment can sometimes make your jaw drop or take the air right out of your lungs. In its first season, there’s been no shortage of either kind of shock, and many of its best moments have done both (as was the case with “Late.”) Something happens, the breath stops, and with a word, an image, a sound, both the horrors of the story and its broader implications come crashing down about the ears. What sets “The Bridge” apart is that it’s not out to shock. Instead, it looks at inevitable horrors, nightmares you can see coming from a mile away. The series has gone to great lengths to dig into the day-to-day realities of these women, and these little moments lead, inexorably, to a bridge, a closed study, a silent car ride. It’s not shocking that Janine can’t give her baby away. That’s been a long time coming. It’s that inevitability that makes it so powerful. This was always going to happen, and very little could have stopped it. In fact, there’s only one aspect of this story that feels remotely shocking. She survives, and that’s the most horrifying bit of all. Another inevitability that pops up in this episode: a pair of great performances from Madeline Brewer (Janine) and Ann Dowd (Aunt Lydia). Dowd’s largely on the periphery here—almost literally, as her meatiest moments come in the first five and last five minutes of the episode—but both she and Brewer do solid, deeply upsetting work. In “A Woman’s Place,” we saw that Aunt Lydia seems to truly believe she’s protecting and caring for the women in her charge. Here, in her several brief appearances, we see that fiction crumble, just a bit, before Dowd yanks it back up again. This is an actor who knows how to do a lot with very little, and she uses that skill to great effect here, setting up her primary scene partner for some truly great work. Throughout the season, Brewer has painted Janine as a woman who cannot help but inch closer to the breaking point, clinging desperately to ideas that she seems to believe fervently while also knowing on some deep, primal level that they’re all a fiction. Director Kate Dennis, like the directors that have preceded her, lets the camera linger on Brewer’s fidgety stance, her agitated mouth, and her one wide, constantly sweeping eye. With each appearance in the present, Janine has seemed closer and closer to an edge, and what makes Brewer’s performance on that bridge so affecting is that all the fantasy has finally dropped away. She swears. She’s still. She wants to do karaoke. Unburdened of the lies that Commander Putnam fed her with, free of fiction that the Aunts are looking out for her, she’s simply herself. It’s horrible, heartbreaking, and yet such a relief. In doing so, Brewer shows us the Janine we saw, however briefly, in flashback, before she lost an eye and most of her mind. She’s not the only character to close a loop in this way. The Handmaid’s Tale finally earns one of its darkly triumphant endings with Moira’s resurgence, an unexpected turn following Samira Wiley’s joyful yet defeated performance last week. Here, the completeness of that defeat becomes apparent—yet another inevitability—and that admittance shakes both her and June to their cores. 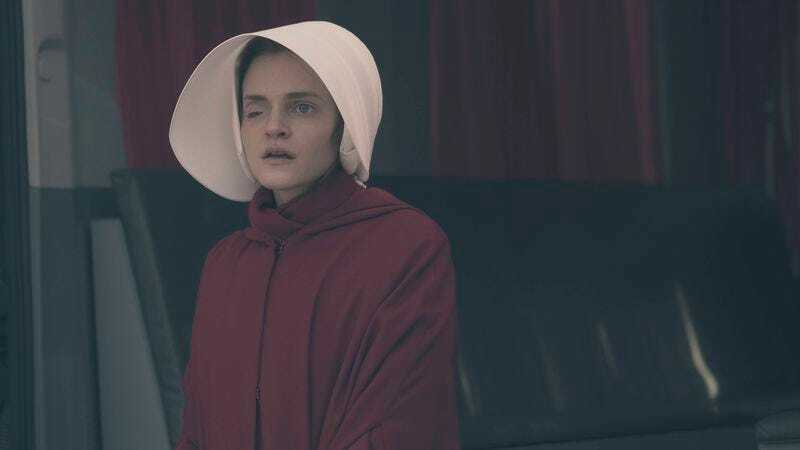 Wiley and Elisabeth Moss have both been great throughout the series, but this is Wiley’s best and most unsettling moment. It’s a stark contrast to the woman who carved graffiti in a bathroom stall and battered and bluffed her way out of the Red Center. With a lesser performer, without those earlier scenes of rebellion, Moira’s return from the dead-inside might not work, but when that maker of bathroom-related weapons looks up with fire in her eyes again, it’s a moment that‘s both surprising and, yes, inevitable. There’s more ‘inevitable’ stuff one could suss out—Serena Joy’s realization that Waterford must “involved” with June/Offred (she’d likely call it “having an affair,” since she warned June/Offred to not try anything in the first episode), the Commander’s recognition that June/Offred is playing him, June’s decision to seek out Mayday—but the most impressive trick that “The Bridge” pulls off is that it’s exactly what it says on the tin. It’s rare that a table-setting episode manages to hide the mechanics as well as this one does, but in an hour that seems largely designed to set up the finale, there’s little that feels like pure set-up. Instead, it puts in place both the moving pieces of the plot (Serena storming into the study, the Commander’s “I’m not stupid,” and of course the package) with smaller moments seemingly designed to remind us of the realities of the world. Outside of the sight of Janine in the hospital, nothing in “The Bridge” is more chilling than Serena asking Rita if June/Offred has “asked for her napkins” yet. We get scenes of Nick talking about the wall, both in the episode and in the previously-on. Waterford is warned to be careful, and then Putnam gets carted off in a dark van. And Moira’s exhilarated face behind the wheel feels like a mirror of Emily’s (Alexis Bledel) earlier this season, which could mean triumph, doom, or likely both. It all points toward next week and next season. That “The Bridge” is able to tick those boxes while putting together a taut, dense, and affecting hour of storytelling is a hell of a feat. After two stumbles, it seems that The Handmaid’s Tale is back on form. As always, visual highlights from the episode will be up on Twitter later today. This episode was a beauty. All the drone shots were particularly striking. More Ann Dowd or we riot. Based on what we know of their friendship and the incredible trauma to which they’ve both been subjected, the argument between Moira and June feels totally justified, and Moss and Wiley are great. That said, the sight of a white woman lecturing a black one about anything is always going to feel gross. Also great this episode: Ever Carradine as Mrs. Putnam—just the worst—and Amanda Brugel as Rita. Her “OK” after Serena told her to pour a drink for herself was the episode’s only laugh for me. Yes, but did the world’s best carbonara come with a side of James Beard award-worthy pesto?